Miami-Dade, Broward and Palm Beach Plumber Located in Doral | Lion Plumbing, Inc. Does not apply to any service $150 or less. Emergencies don't stop, so neither do we. See what clients are saying about our work. Recognizing and honoring the best of business. Lion Plumbing, Inc., is a family-owned and operated business that has been	serving Miami-Dade and Broward county for over 10 years! Our Miami-Dade and Broward plumbers are well-qualified to assist you, as	they rely on	more than 30 years of experience in the industry. Whatever type of plumbing issue you are dealing with, we will provide	our service	on time, every time! To schedule a service appointment, please call us at one of three locations. 24/7 service—emergencies don’t stop, so neither do we! At Lion Plumbing, Inc., we have technicians who are prepared to handle	a wide range of plumbing issues. Do you a leak in your pipes, a clog in	your drain, or a water heater that is giving you trouble? If so, our skilled	professionals can handle the job. 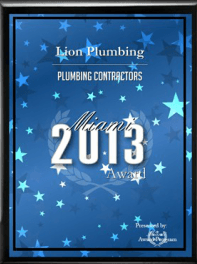 We are proud to be a	recipient of the 2013 Plumbing Character – Miami award, which serves as a testament of our commitment to top-quality service. With our expertise and our fully stocked service trucks, we are always	prepared to get the job right the first time. We won’t stop working	on your plumbing issue until we have ensured that you are fully satisfied	with the results. In addition, our team speaks Spanish. Se habla español! If you would like to schedule an appointment or find out more about our	services, please	contact us at (305) 597-4555.